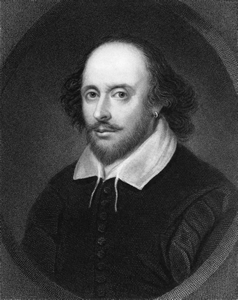 English speakers often repeat lines and expressions from the plays of William Shakespeare, knowing that they are quoting (= saying words by) the famous English writer, (1564 – 1616). However, they also use phrases as part of ordinary ‘everyday’ English without even knowing that they appeared in Shakespeare’s plays. Some of these phrases Shakespeare himself coined (= invented). Others, which were already in use when he was writing, became popular after he included them in his plays. The phrase a fool’s paradise is used in modern English to mean ‘a situation in which someone is happy because they think they are in a good situation although in fact, the situation is bad’. (A ‘fool’ is a stupid person and ‘paradise’ is a very happy place). This phrase appears in Shakespeare’s famous play Romeo and Juliet. The character of Nurse talks to Romeo in order to find out whether he loves Juliet. She warns him not to lead Juliet into a fool’s paradise, meaning that if Romeo does not love Juliet, he should not make her believe that he does. People sometimes say, ‘All that glitters is not gold’, meaning ‘things which seem at first to be good are sometimes less good when you understand more about them’. (The phrase literally means ‘not everything that shines is gold’. ‘To glitter’ means ‘to shine brightly’.) This phrase was used in Shakespeare’s play The Merchant of Venice, although Shakespeare used the old word ‘glister’ instead of ‘glitter’. This is a theme that we often see in the plays of Shakespeare – the idea that appearances can be false, making you believe things that are not true. If you are doing something that seems strange, but there is a good reason for what you are doing, you might say that there is method in your madness. In Shakespeare’s play Hamlet, the main character of Hamlet starts to behave very strangely. A character called Polonius sees Hamlet’s behaviour and says, ‘Though this be madness yet there is method in it‘. He means that although it seems as if Hamlet is mad, there seems to be some ‘method’ (= reason or sense) in his behaviour. In Shakespeare’s very violent play Macbeth, the Scottish soldier, Macbeth, kills the king with a knife. After the murder, Macbeth looks at his own hands, covered with blood. Suddenly regretting his terrible crime, he says, ‘This is a sorry sight.’. Nowadays, if we describe someone or something as a sorry sight, we mean that they appear to be in a bad state. We use the phrase in a slightly funny way. In modern English, if you wear your heart on your sleeve, you make your feelings obvious and do not try to hide them. This phrase appeared in Shakespeare’s play Othello where the villain (= very bad character) called Iago says he will pretend to wear his heart on his sleeve so that the people around him trust him and think they know him. This will allow him to deceive them. In modern English, the phrase only has the sense of making your feelings obvious, and there is no sense of deceiving people. In the comedy Twelfth Night, the character of Maria, says: If you … will laugh yourself into stitches, follow me. In modern English, if a joke or funny story has you in stitches, it makes you laugh a lot. Next week, we will look at a few more of Shakespeare’s phrases still used in the language today. The frase don`t judge a book from its cover should be used in similar contex as all that glitters is not gold? Hi Sergio, that’s a good question. I think that they’re similar, but a major difference is that ‘you can’t judge a book by its cover’ is often used to mean that something, or someone, can be a lot better than they appear. ‘All that glitters is not gold’ is saying that things (or people) that look good are often worse than they appear. Shakespeare had great timing: he wrote immortal drama just as the modern English language was taking its current form. Not at all coincidentally, he shared a patron with the King James Bible, the first English translation of the Scriptures and an equally fertile source of familiar English expressions. Hope you’ll continue the journey through all of the language James left us. Thanks for sharing your knowledge with us In my language (spanish) we have similar expressions that match with those written by Shakespeare. I love to know it´s roots. Thank you… I am a new comer. So please, wish me good luck. Although I have been a regular visitor of Cambridge Online Dictionary but it was today the blog section caught my attention and I am glad I found. It was back in 2007 I came to know about the words coined by Shakespeare which enriched my use of new words in my learning. I will be looking forward to reading part 2. Thank you!